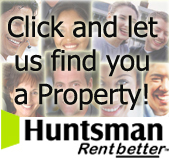 Huntsman - Home - Rent Better, Better Properties To Let. Their local knowledge means that they can focus on the portfolio of landlords within a specific postal code. They can advise prospective tenants of facilities, transport and local amenities to enable them make a better choice. At Huntsman we believe we can offer you a better service, offer you better tenants and can ensure that the process of renting your property is enjoyable and free of worry. Every property is photographed and a full Huntsman Spec Sheet is filled before we list any new property..
We take care of the contract, changing over the utility bills, setting up the standing order to your bank account for the rent payment, ensuring that the lease is understood by tenants before they move in. We also check of the property when tenants move out.